...and plan to use it above 3000', keep looking: the High Altitude kit you WILL need to obtain proper performance is not yet in production, and won't be in production for the foreseeable future, according to a parts person at Wagner Cat in Denver. I bought one last summer, and would not do so again, if I had another chance at it. I used it for a weekend camping trip at about 8000' last summer, and obviously it ran rather rich. Not optimal, since such a running condition reduces output, but I figured I'd be able to correct it before the next summer. Apparently not. So, don't make the same mistake I did-- buy ANY other 2KW generator but the Cat INV2000 if you intend to use it at high altitude. I wish I had. Have you attempted to look at the carburetor to see if the main jet is removable? If it is and you can identify what size main jet you currently have, then you can easily purchase a group of smaller main jets, trying each until you find one that works well. The Honda Trail CT90's had for most years a push/pull slide to change the amount of air entering the carburetor for high altitude operations above 6,000 feet ASL. The last few years of the CT90's and the later Honda Trail CT110 models didn't have that push/pull slide and instead required a main jet in the carburetor to be changed down two sizes. That was the only modification required to operate the Honda four stroke engine at higher altitudes. The common parts source for motorcycle jets is Jet R Us. However, just search the web and you'll find lots of other jet sources, even Amazon. Might be worth a look see. Or, sell the Cat INV2000 to someone in Florida, next August, right before hurricane season. I understand having to procure the necessary parts, and that looks like the route I’ll have to go. I did the very same trial-&-error rejet process with my ‘67 Jeep M715. The thing is, I didn’t buy this generator looking for another project. I have plenty, some fun (above Jeep, IH 4x4 dually/Alaskan camper RV), some not so much (ongoing maintenance on gutter trailer & the truck that pulls it), and footworking a generator rejet is an unwelcome addition to this list. Besides, this really wasn’t the point of my original post. If Caterpillar was the latest gofundme startup, I could have some compassion for a ball-drop like this, but they’re not; they’re a multinational corporation completely capable of avoiding such customer service snafus— they just chose not to, out of sloppiness, or whatever. I happen to be capable of throwing together a remedy for this, but a lot of potential buyers of one of these generators aren’t, and they’re who I was trying to help out by posting this thread. Thank you very much for the jet source, BTW. That generator looks just like one of the many Chinese gensets out there. The Sportsman brand being the closest I think. I doubt they will make a high altitude jet kit though as there is unlikely much of a market for parts that would be used at 8000'. However it's pretty easy to figure out that you have about 25% less O2 so you would need a main jet and needle that will flow about 25% less fuel. I think the first mistake you made was that you assumed Cat would make a high altitude kit and then the second was that you probably paid twice as much as you needed to for a Chinese genset because it was yellow. Champion seems to offer a high altitude jet kit for their 2000 watt inverter gen but I did not bother to post a link because I would feel bad doing something that you are unwilling to do. If you’ll reread my original post, the HA kit is specified for altitudes >3000’ which is all of the state of Colorado, for example. Ironic you’re describing to me what my assumptions were at the time of purchase. Having run Cat equipment over the years, I figured this generator would perform well and be adequately supported by them. I wasn’t thinking about specific components when I swiped my card. Thanks for the info. The added sarcasm wasn’t necessary or welcome, however. 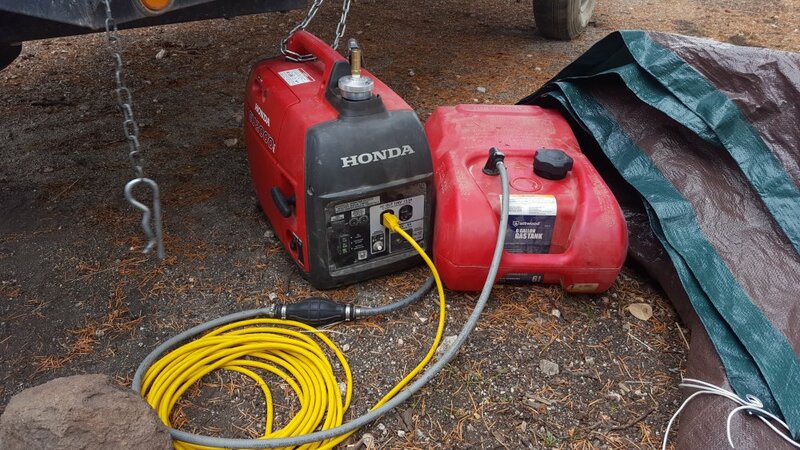 I have a Honda 2000i and have used it up to 8000 feet many times. The Honda is bullet proof.